Application RT600 adhesive with screw. Foam (1 or 2 part) with screw. Foam or adhesive with no screw. Sizes Available in 5 standard sizes of 4″, 5″, 6″, 7″ or 8″ for various tile profiles. Fasteners 1 1/2″ self-sealing neoprene washer screws spaced 16″ o/c. 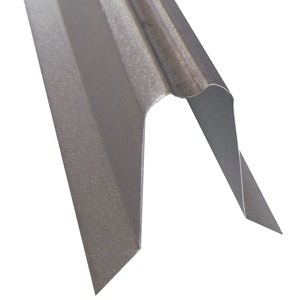 Approved ring shank nails spaced 6″ o/c., roof cement and membrane. Materials 26 gauge pre-painted Galvalume* in 10′ lengths. Other lengths available upon request. Available in a variety of colors. Approvals & Testing FBC product approval #FL-6046, FBC HVHZ approval # FL-8380, Quality Assurance Program. Fabricated from Galvalume* for corrosion resistance. Beveled top edge to form to standard hip/ridge tile. All DCSM products are made from Galvalume not galvanized. Galvalume offers far superior corrosion resistance. Contact us for more details or literature.